I just came across a Wikipedia page explaining the history of chess notations and there is some amusing stuff there. These days, chess notation usually looks something like e2-e3 (long form) which stands for a pawn move in column e, from row 2 to row 3. For those that don't know, some chess players write down chess moves in order to help remember how the game progressed. How did history write chess notations? In 1848, the standard was K. Kt. to B's 3rd. In 1750, they used K. knight to His Bishop's 3d. In 1614, The white king commands his owne knight into the third house before his owne bishop. ps - For those that don't know, every chess board nowadays has each of the squares labeled alpha-numerically using A-H and 1-8. It is useless to have two different words mean the exact same thing. I don't like to argue. But, I do like to debate. - At a rudimentary level, "complaining for the sake of it". - At a basic level, "explaining, using logical fallacies". - From a chess perspective, "perfectly symmetrical debating that has stalemated 5+ moves ago (think: KvK)". - At an elementary level, "listing pros and cons"
- At a fundamental level, "two sides taking turns, presenting their ideas to the other. Typically has an outcome." - From a military/infantry perspective, "arguing in the form of bounding overwatch, where progress is achieved." If you have any comments about arguing versus debating, then I'd like to hear you in the comments below. 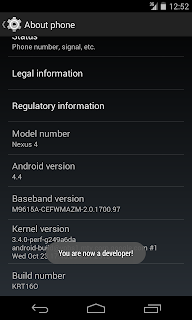 A few days ago, I had my Nexus 4's OS updated from Android 4.3 to Android 4.4. The system is running very smooth. Two of the first things I did was enable developer mode and then enabled all apps to use the new ART compiler rather than the old Dalvik compiler. You are now a developer! Again! This is not new news by a longshot. But, through the regular course of my day, I encountered this error again and decided to take a picture so that I can let others know about it too. In order for developers to have the pro versions of their apps, they must side-load it. And, it is typically a debug (non-public release) build. 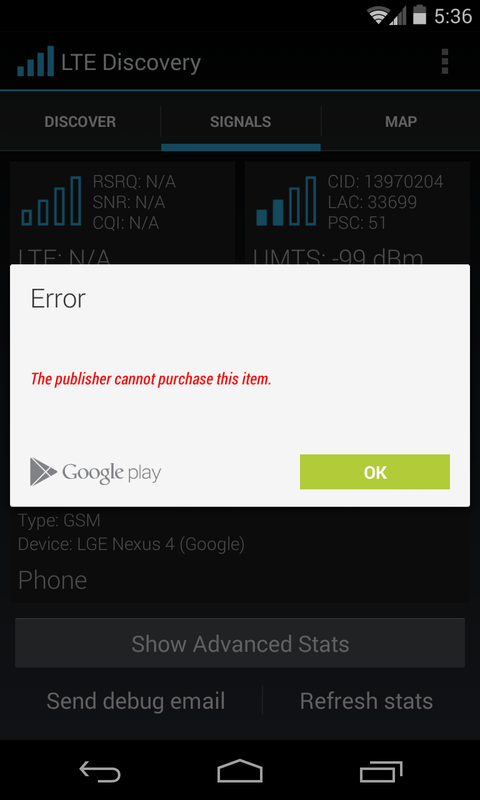 The publisher cannot purchase this item. Well, I guess it at least saved me 30% of the app cost if I wanted to buy from myself. 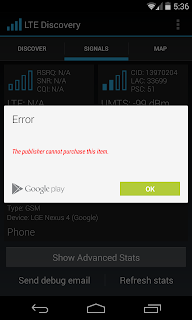 NOTE: This only applies to when using Google's in-app billing system. I don't think third-parties care as much about who is giving them money. "No reason" is not always "no reason"
"no reason" is not always "no reason". Have you ever given the reason or excuse, "no reason"? At first it seems like a simple phrase that could just be expanded to, "for no reason at all". This has the potential to have significant implications depending on its use case. The first interpretation is the more literal definition that really does mean zero (0) reasons. The second interpretation is the more exciting definition that allows for spontaneity. Now, how does this help you, the reader? Honesty, I'm not sure that this knowledge helps you with any practical applications in life. Examples are hard to come by because just about all the "no reason" excuses/reasons could be purposeful or not. It just depends on the person and their conviction/confidence. ps - I may have used some aggressive adjectives in this post that are too indicative. One reason I write like this is to practice my copywriting so that I can more clearly express myself fully. pps - "Because because" is not always a non-answer. But, it is definitely a unfinished sentence/idea. Before today, I was level 0 in dealing with any vector graphics. In order to avoid pixelation in some of my images for a new app I'm creating, I had to open a SVG file and expand it from within there, then save it as a PNG. Now, I am level 1 in messing around with scalable vector graphics. There are some commercially available products that open and manipulate SVG files, like Adobe's InDesign, CorelDRAW, and others. But, my choice is the free and open source Inkscape. Also, they provide some great tutorial in-app to help learn how to use it. The bad thing about having good memory is that, along with all the good things remembered, you also remember the mistakes. Maybe that isn't a bad thing. We are supposed to learn from our mistakes, right? How can we do that without first knowing the mistakes and remembering them? Many people love to eat Oreo brand cookie sandwiches, some find the Oreo eating experience better with milk. One way to have milk with an Oreo is to eat them separately, but together. I.e., first a bite of Oreo, then a swig of milk, then repeat. Another great way to combine the two great products is to first dip the Oreo into a cup of milk for a few seconds, then enjoy how moist and soft the cookie is. Place Oreo in on tongue in mouth. Sip enough milk to barely drown the Oreo. After waiting a few seconds, eat/drink both together. Pro tip: You can break the Oreo in half in your mouth in order to create a larger surface area for the milk to interact with the Oreo. Out of these three methods, I believe that method 3 is the most efficient and satisfying way to enjoy an Oreo cookie with milk. But, out off pretend fairness, I will compare the pros (and cons) of method 2 and 3. You could just dip half of the Oreo into milk if you wanted to. You get to say that you can dip an Oreo in milk. There is no cup small enough to worry about getting your hand stuck. When there is a low amount of milk left in the cup, it doesn't matter. By breaking up the Oreo in your mouth you create more surface area for the milk to react with the cookie and the cookie softens faster. There are no sad Oreo pieces left in the bottom of the milk cup. If you have any opinions related to Oreos and milk, then I'd be happy to hear about it. "Reading Isn't Free. The Cost Is Opening Your Mind To New Perspectives"
Today, as I was riding my bike 3.5 miles to play volleyball, I thought up of a new tagline for my blog, "Anonsage. Think. Do. Learn." The old tagline was, "Thinking about thinking about thinking. Don't be stuck in a paradigm, facts change." And, I really like that one. I might even use it again. Or at least feed it to one of my sub-blogs to use for awhile. But, now, I think I have a better line, only because my old lines has been in use for such a long time. "Reading isn't free. The cost is opening your mind." Reading isn't free. The cost is opening your mind to new perspectives. Personally, this might be my favorite because it has "new perspective" in it. But, in order to be Simply Advanced™, I have to limit things if not too much is taken away. I hope "cost is opening your mind" makes enough sense. Perhaps, I'll try both in some A/B testing. I would like to see which version aligns with readers better. The cost of reading is opening your mind [to new perspectives]. It's short and sweet, but I don't think it is as powerful as, "Reading isn't free". The cost of listening is opening your mind to new perspectives. This is a more general quote, which is more useful when in a non-reading context. I could think of others right now, but my blog posts have recently been getting on the really long side. So, I'll leave it up as an exercise to the reader to think of more variations on "reading is not free". 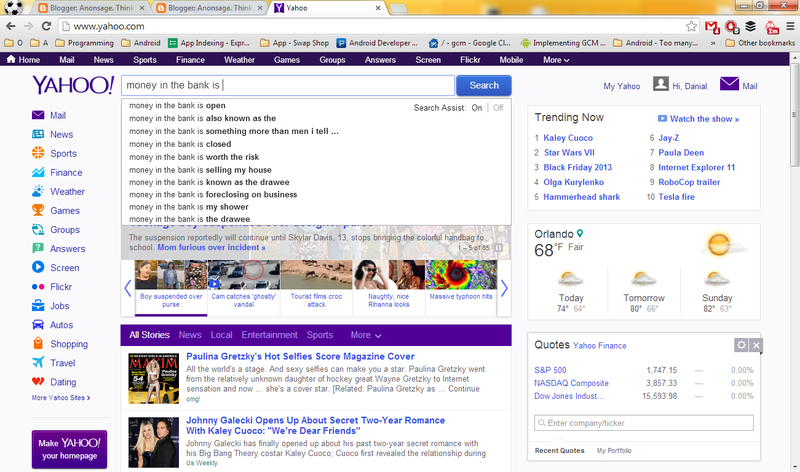 ps - At the time of this writing, Google search returns no results for any of these quotes/taglines in quotations (","). Every month, I get a new activity report from Google. This report tells me all the things my Google account has been up to for the past month. It's great to see how many sign-ins I've had, how many more sites/apps/services that I've connected to, and a lot more. I have a general idea of all the services I log on to with Google, and I use Google Account Activity (beta) as another security precaution also. This post is mainly about all of the emails I have received and sent this past month (12 October 2013 to 08 November 2013). As my apps get more popular, I've been receiving many more emails daily. Though, I am grateful for all the feedback. It will only make the apps better. Yeah, that's 1,115 emails received and 233 emails sent for this four week period (28 days). Doing a little math, that's about 39.8 emails received everyday and 8.3 emails sent per day. I do my best to respond to emails within 24 hours, but sometimes they might get missed unfortunately. That's why in each of my email signatures, I include, "I welcome VSRE emails. Learn more at vsre.info". Because, if somebody emails and wants/needs "very short reply expected", then more likely it is I will respond right away rather than waiting until I have more time to write a proper response. This is just the beginning of my endeavor as an app developer; 100k downloads means there is definitely still room for growth. Whenever I get the sudden thought to play a game, I think how much more satisfying it will be to just create a game instead. Or at least create another app. I first got into computer programming in high school by editing the source code of a popular MMORPG (Runescape) in order to make it better. The language was Java, but at that time I just knew it as code. And, with no prior coding experience I could understand and walk through much of source code without looking up what different words meant. I just thought that was cool, it felt great how everything just clicked together. But, it actually wasn't until a few years later as a sophomore in college that I actually decided to get into computer engineering and take my first real logic and programming class (basically, the school said I choose a specific degree to work towards. I just wanted to learn everything). 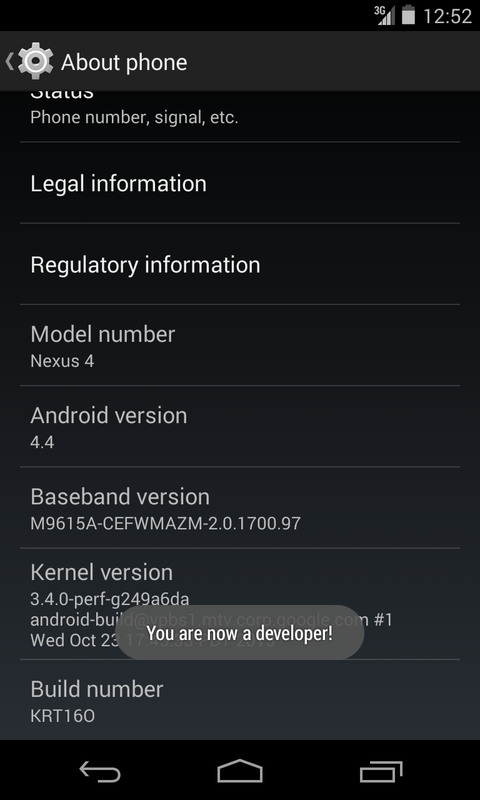 As you work on more parts, you "level up"
Working Title, "Basically, Android Expained"
I am an Android developer. I have been one for a few years now. In that time, I've had the pleasure of helping many people with technical questions. I believe one of my specialties is being able to explain complicated concepts in simple, laymans terms. Over the years, I was bound to give repeat answers eventually. So, in order to keep myself more efficient, I will start adding all of my layman explanations to a wiki, which I will eventually probably turn into some sort of ebook. The book will be titled, "Basically, Android Explained". I still have a few working ideas for a tagline. I chose to title the book this way because almost all my explanations start off with "Basically, ...". This single word is very important to my explanations because it signifies that what follows is NOT everything explained. It is just the easiest explanation for a non-developer or a new developer. I'm not sure of the entire structure that I want to use for my definitions, but one way is to have the first sentence be "Basically, ...", then the following sentence would be a more technical definition, then after that will be the reasons for using it. KeyStore: (also referred to as a Java keystore or keystore file) A security certificate used for authorization. Basically, an app's signature. It proves that the app was made by a certain developer. This is a precautionary security measure that prevents malicious apps from replacing another app." That was just a quick rough draft, I have a few more ways to explain this concept. Feedback always welcomed. Description: Where advanced technical concepts are abbreviated to quick/light readings. In my blog post yesterday, I had to use the auto-complete feature that search engines provide in order to quickly learn some new perspectives on how society thinks about a certain topic. Though, I figured out that the results weren't society as a whole, but the community of users that use that search engine. 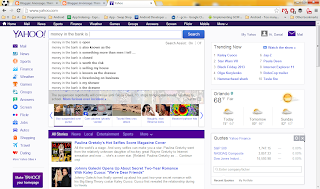 A little background: Search engines want to show the best results to users. One part of how they try to do this is by analyzing the way users use the search engine. Basically, the more times users search for a phrase, the more likely it will appear at the top of the auto-complete suggestions (Yahoo calls this feature "Search assist"). Analyzing a single search engine has been done before, but I in this post I analyze the differences between different search engines. This answers the question, what type of users use Google/Bing/Yahoo? The practical uses of knowing the answer to this question mainly lies in ads, or marketing to be more exact. When one purchases Google ads and Bing ads, maybe they shouldn't be using the same copy or text or graphics. The user demographics may be different. This information also helps out the search engine when advertising their product to more users, or adding features for current users. 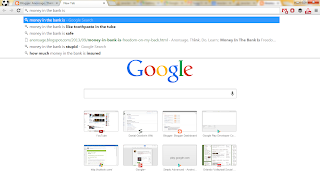 My search seed for the auto-completion suggestion search was "money in the bank is ". - "Money in the bank is like toothpaste in the tube"
- "Money in the bank is safe"
- "Money in the bank is stupid"
- "How much money in the bank is insured"
- "Money in the bank is peace of mind"
All of these seem like reasonable perspectives, or at least understandable. 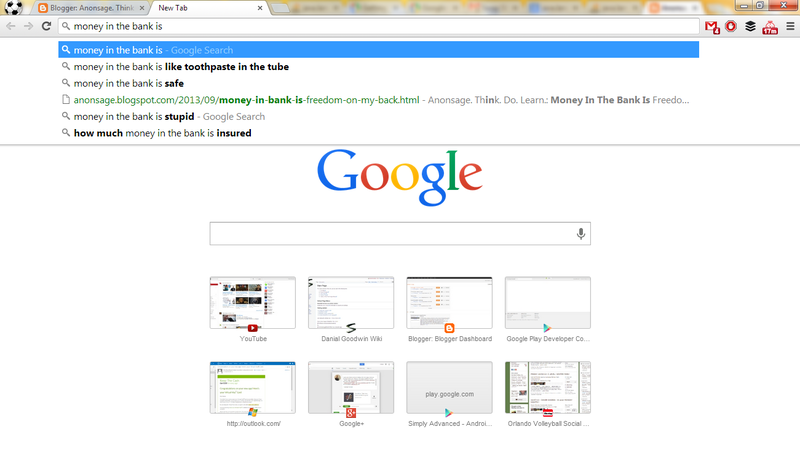 When using Chrome's incognito mode, only the last "peace of mind" one shows up. - "Money in the bank is it m1"
- "Money in the bank in the water"
- "Money in the bank in hot springs ar"
- "Money in the bank images"
- "Money in the bank injuries"
- "Money in the bank singer"
- "Money in the bank instrumental"
These are very interesting results. The very interesting thing about these results is that it shows what type of people use each search engine! So many things can be said about each search engines' users. - "fire" and "fire " are both great. Microsoft stands out in this one, the first four auto-complete suggestions are four Firefox (browser). - "safety ". Let's see, here's the first auto-complete suggestion for each search engine: Chrome - "safety not guaranteed", Bing - "safety topics", Yahoo - "safety 1st"
Disclaimer: For these quick searches, I used incognito mode in Google Chrome. If you think of something I missed, then please share it in the comments! 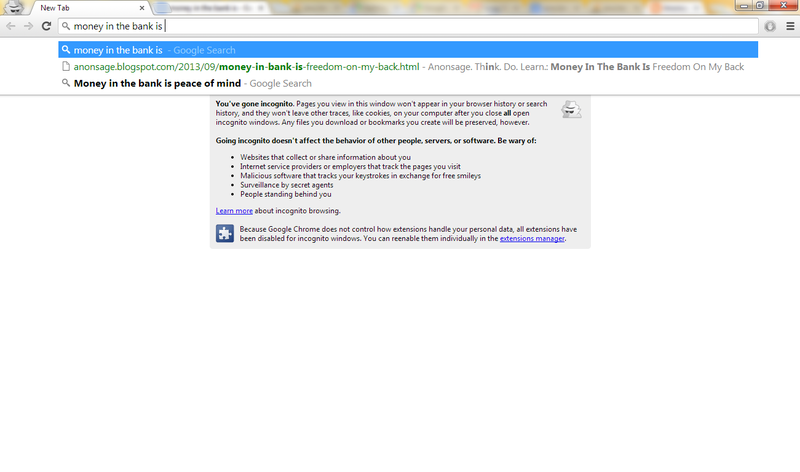 So, awhile back I wrote a post titled, "Money In The Bank Is Freedom On My Back". I just thought of a small extension to it, so sharing away!! Last time, in an uncharacteristic fashion, I wrote from a single biased perspective. So, I want to make it up this time by better covering multiple perspectives about "money in the bank". 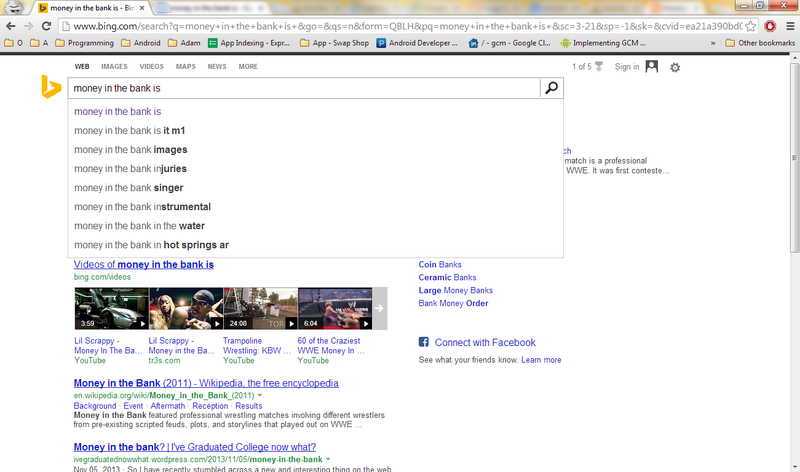 To begin my basic research, this time I opted for the auto-complete feature of search engines. This blog post was suppose to be about me extending my previous money blog post. But, these are very interesting results. I probably should write another post just on the results (I did right here: Money In The Bank 3). The very interesting thing about these results is that it shows what type of people use each search engine! So many things can be said about each search engines' users. Here's just one of the ideas before I link to my full write-up on these results. Google users appear to be straightforward. 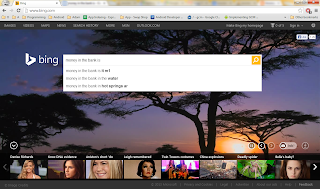 Bing users appear to be more influenced by media (click here to read more search engine user analysis). At least it grows more than money under the bed. Freedom to be yourself, not have to work in disliked job. Freedom to travel. When I started this post, I did not know there were going to be this many different thoughts about it. And, these are all big picture still. If anybody else things of more, then I will gladly edit this "chart" to reflect that, and include the idea-er's name. The real reason I started writing this post was to talk about what's the difference between greed and ambition? ps - Maybe it's perspective on life. That may or may not be all of it. I can only conclude that the universe has always been. I'll provide the argument from two different perspectives in this post - from the science side and from the religion side. The major contender is the Big Bang Theory. If that were the case, then eventually more scientists will start asking what caused the big bang? And, what came before that? There will always be cyclic thinking that something always came before. Ergo, the universe has always been around in some form [as far as we know/believe]. The universe is basically defined as everything/totality (sidenote: a universe of multiverse, paradox?). So, whenever there was a deity, there was also a universe. Most religions believe that their deity has always been. Thus, the universe has always been [as far as we know/believe]. I'd be happy to hear more academic dialog about this. Just let me know in the comments. Yesterday, many people in America had to put their clocks back an hour for daylight savings. Today, I was wondering, if I set an alarm for 2:30am, would it go off twice? What about for 3am? And, that leads to think of when daylight savings ends with the switch of the clocks forwards an hour at 2am in the morning on a nice Spring Sunday. What happens when I set my alarm for 2:30am on that same Sunday? Today, while I was thinking about being able to make time for blog posts or not, I thought of "You have time for anything, but not everything." But, that doesn't mean that I won't try! The sudden thought occurred to me, though perhaps not new, there's a strong possibility that large companies like Google and Apple and Microsoft purposely supply less than demand. It seems like just about every time a device is produced, it sells out. I know producing millions of phones is a lot of work, but for the purposes of this post, I'm going to consider that these large companies choose to throttle output. Determining market demand is not an exact science, but it can be determined to a degree of significance how much demand there is, even just looking at past trends. So, if companies can't determine exact demand, then they will either produce more or less needed (:idea:). If they produce more, then the extras could be sold eventually. If they produce less, then they sell less (at least in the beginning). Now for more specifics for meeting demand. If companies produce supply to meet demand, then they do have the opportunity of making more money in the short run, but the long term revenue differences would be insignificant. Another benefit of satisfying demand might be that more consumers have the brand's device in their hands. 1. More publicity. Journalists don't know exactly how many devices are produced/shipped, all they know is when something is out of stock. 2. Inflate prices/value. Google sells the Nexus 5 for $349-399, but you can find some pre-orders selling for $600-650. Also, more publicity. 3. The large companies don't have to worry as much about their devices flopping. Aka, mitigating risks. 4. More publicity. This time the reason is for when the large tech companies ship their second and third rounds of devices. 5. Chance to fix some [software] bugs before "everybody" gets the device. 6. Also, minimize costs of a recall... just in case. Any more thoughts that I missed?